There has never been a single definitive source of key information on all facets of discrete-event simulation and its applications to major industries. 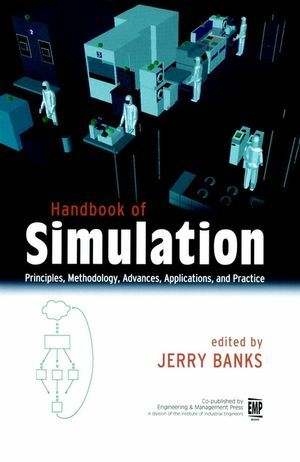 The Handbook of Simulation brings together the contributions of leading academics, practitioners, and software developers to offer authoritative coverage of the principles, techniques, and uses of discrete-event simulation. JERRY BANKS is a professor in the School of Industrial and Systems Engineering at Georgia Institute of Technology. He has taught simulation at the university level and in short courses for many years. He is a frequent author on the topic and a longtime consultant in the area. Principles of Simulation (J. Banks). Principles of Simulation Modeling (A. Pritsker). Input Data Analysis (S. Vincent). Random Number Generation (P. L'Ecuyer). Random Variate Generation (R. Cheng). Experimental Design for Sensitivity Analysis, Optimization, and Validation of Simulation Models (J. Kleijnen). Output Data Analysis (C. Alexopoulos & A. Seila). Comparing Systems via Simulation (D. Goldsman & B. Nelson). Verification, Validation, and Testing (O. Balci). Object-Oriented Simulation (J. Joines & S. Roberts). Parallel and Distributed Simulation (R. Fujimoto). On-Line Simulation: Need and Evolving Research Requirements (W. Davis). Simulation of Manufacturing and Material Handling Systems (M. Rohrer). Simulation in the Automobile Industry (O. Ulgen & A. Gunal). Simulation of Logistics and Transportation Systems (M. Manivannan). Simulation of Healthcare (F. McGuire). Simulation of Service Systems (R. Laughery, et al.). Military Simulation (K. Kang & R. Roland). Discrete-Event Simulation of Computer and Communication Systems (A. Hartmann & H. Schwetman). Simulation and Scheduling (A. Kiran). Guidelines for Success (K. Musselman). Managing the Simulation Project (V. Norman & J. Banks). How Discrete-Event Simulation Software Works (T. Schriber & D. Brunner). Software for Simulation (J. Banks).